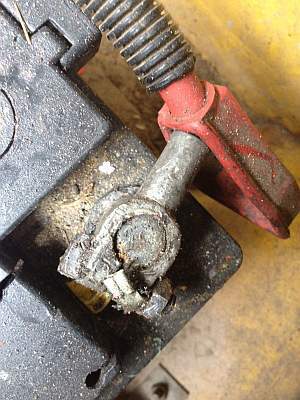 Home » Blog » Maintenance, Repairs & Bodges » New Starter Motor – New Beginning? Avid readers of my website (Hi, mum!) will be aware that, although I am over the moon with Murpha's 200tdi engine and gearbox conversion, I was having intermittent starting problems. It seemed I'd sorted this out – it was just a bad earth – and I wrote about it. You can read the article by clicking here. Well, Murpha behaved herself for a while afterwards, but there was the occasional time when all that would happen when I turned the key was that I'd hear a 'click', but she started on the second turn. Not to worry – I'll clean up all the battery terminals (they were not in the best of shape! ), as well as the earth connections. Actually, sod it, I'll even buy another earth strap; I'd done some forum research and it appears that you can't have too many earths! That'll finish the job off and I can sleep easily at night. So, out came the bicarbonate of soda and a wire brush. Then, to be honest, out came the carb cleaner, which I found to be a lot quicker! The result was a sparkly battery connection and clean earth lead running from the starter motor mounting bolt straight back to the battery. Job done. All I need to do now is drive to Halfords, pick up an earth strap and I'll be worry-free. So, part one complete, I drove into town, bought the strap, got back into her and...CLICK. CLICK. CLICK. I SWEAR MY LAND ROVER IS ALLERGIC TO THE HALFORDS CAR PARK – THIS IS WHERE IT HAPPENED LAST TIME! Anyway, this time my trick of earthing the starter motor with a jump lead didn't seem to work. Eventually, after about half an hour, she turned over and started. SOMETHING, SOMEWHERE had freed itself enough to turn over. Thankfully, this engine fires up immediately. My plan to stop for shopping on the way home was thrown out of the window. I drove straight to a Land Rover specialist near Ipswich, parked up with the engine left running, and asked them for a quote for a starter motor - £100 + VAT, give or take a quid. Apparently, you can split the starter and solenoid, but I couldn't be bothered with that, especially as I didn't know which bit wasn't working! 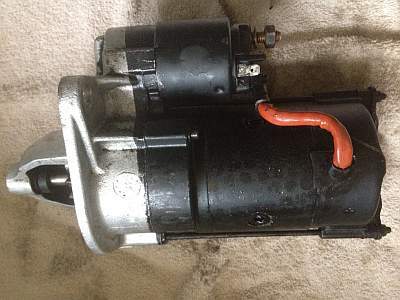 I got onto eBay and found a 200tdi Discovery starter motor from a 4x4 breaker for £38, delivered. Bargain! They had 100% positive feedback, said it was tested and offered a 3-month warranty. Bonus! I ordered it that night and it was with me 36-hours later, which I was over the moon with. In the meantime, I'd done a bit of Google research about replacing the starter motor on a 200tdi and was getting a bit worried; removing downpipes, manifolds, watching out for brake pipes, damaging this, that and the other....sheesh! I decided to ask Si at Hangar 53 if that was, indeed, the case. “No, what a load of rubbish. 30-minute job.” Good on him – as a mechanic, he could have easily said “Yes” and convinced me I shouldn't do it myself, but they're an honest garage. A real gem these days. 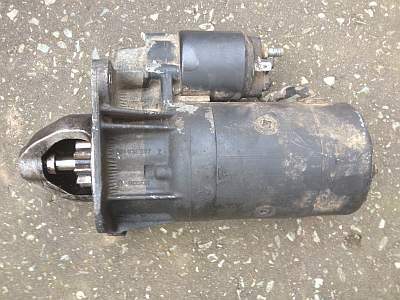 I'd planned to clean the starter motor when it arrived, but the seller (chf4x4) had already done it for me. Splendid. What a great seller – they are now in my favourites list! I was convinced, now, that something had to go wrong. This was all too easy! The battery was disconnected (praise be to the isolator switch – so much quicker! 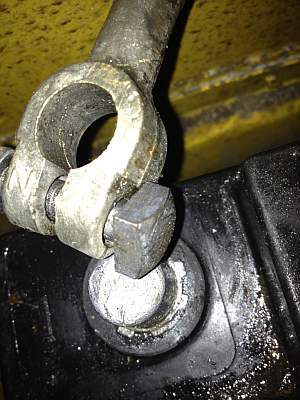 ), the leads removed from the solenoid (one bunch to the positive and a smaller lead from the ignition that fits onto its own spade connection) and the two bolts and one nut removed to free the starter. That's really all there was to it. The bolts were fairly tight, so I just found a metal tube to slide over my ratchet to give me a bit extra leverage, and that was that. I didn't even have to swear at anything. Then it was a case of simply wiggling the old motor out (I read on one forum that I should take care, as it is 'quite heavy'. Seriously, dude, get down to the gym...) and then doing the reverse to put the 'new' starter motor back in. The old starter motor - probably the original. I replaced the end of the ignition lead connection, as it was old and grubby, slid that back on and fired her up. Yay! I won't say the problem's fixed yet, as it was intermittent, but if it's not doing the 'CLICK' thing next week, it'll mean that the problem was the solenoid all along...and that Si from Hangar 53 nailed it from the start, as that's what he said! Grrrrrr!